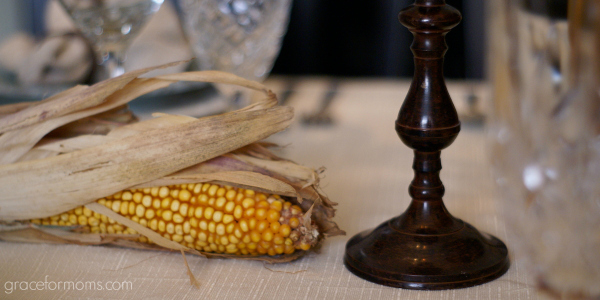 A few years ago as I prepared to have our family over for Thanksgiving dinner, I thought about the treasures I might set on the dinner table. Each one I perused sent me reminiscing about its origin. I was taken back to my childhood, my wedding day and friendships throughout the years. I decided then and there that I always want our table to tell a story…our story. Every table we set is a scrapbook of sorts displaying our life and legacy to its guests. And as we gather around it to share tales of the past, struggles of the present and hopes for the future, we can be surrounded by reminders that life is sweet and so worth loving. Candlesticks from our wedding day. An ear of corn to represent the family farm; my husband’s heritage. Serving pieces that once belonged to my mother, mother-in-law and their moms. A pitcher given to me by a once-dear friend, now less a part of our lives, but no less a part of our story. Our lives are a story worth telling. Through ups and downs and in the midst of crazy messes, we build a legacy that our children will carry for years to come. 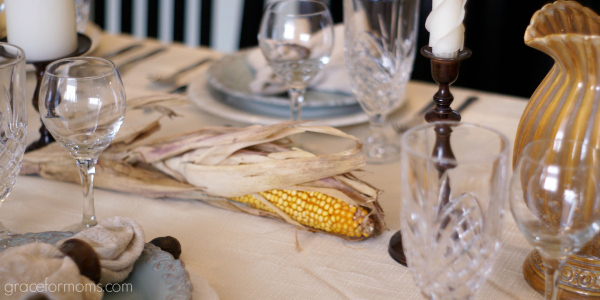 A Thanksgiving legacy table is simply a table setting that displays the pieces of your story and encourages family members to enjoy, discuss and celebrate blessed life moments. 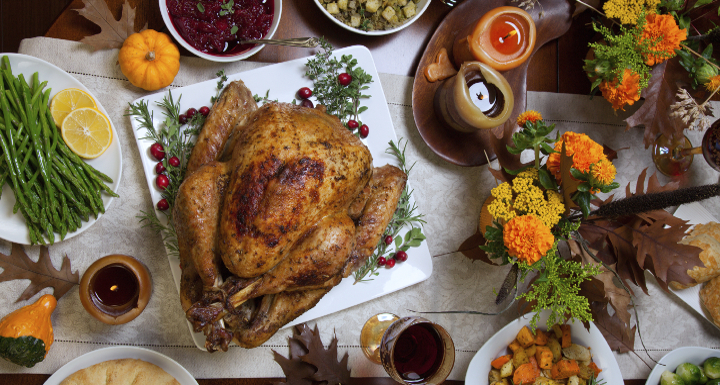 As you prepare for Thanksgiving, think about ways you can include your family legacy in your table setting and activities. 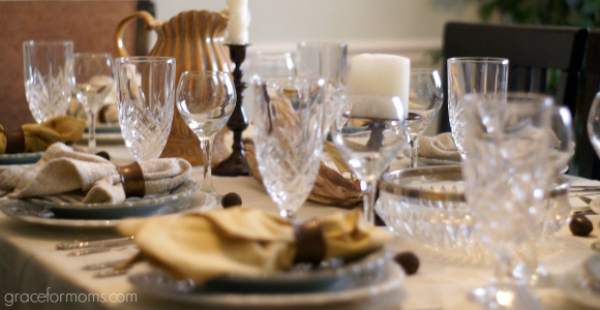 Find meaningful pieces of history to display or use throughout dinner and family time. Use items that will strike up conversation about lost loved ones and treasured memories. Since that first day I set our legacy table, I’ve lost my mom to cancer at the very young age of 63. Now more than ever, I’m committed to sharing her story with my children to ensure they remember the moments they were blessed to have with her and understand the impact she had on our lives. Her beautiful china and vintage tablecloths will never replace her presence, but they bring her to mind and cultivate conversation that honors her life. I want my children to know where their legacy began and be a part of where it is going. I can’t think of a better place to have that conversation than around a Thanksgiving table filled will tangible highlights of our story.